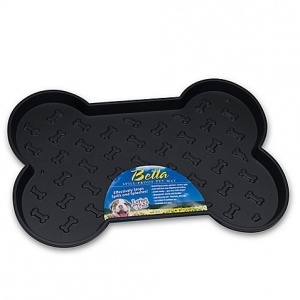 The award-winning Bella Bowls are hugely popular with dog owners, and we can see why. This large rubber mat perfectly complements the Bella range of dog bowls, but can of course be used with any bowl of your choice. With rubber feet, it cleans easily, is extremely durable and designed with lips to prevent water spilling on the floor. Large size dog bowl mat - approx 54 x 44cm.